There are 31 currentrly listings that match your search criteria. 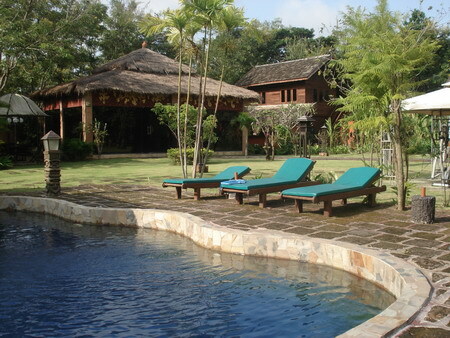 Beautiful Resort for sale in Hangdong, Chiangmai, Thailand. This peaceful resort with Private Swimming Pool is located Hang Dong District, Chiangmai Province. The resort area 2 Rai 72 Sq.wa. Mountain View and Field View, Feel the air is serene. There are 4 beds 3 baths with fully furnished. This resort is nearby Royal Flora Ratchapruek Park, Chiangmai Night safari, Panyaden School and Hang Dong Golf Club. -Lot Size: 2 Rai 72 Sq.wa. -Price for sale: 23,500,000 THB. Attractive boutique resort set in more than 2 rai of land in the Sansai area of Chiang Mai available for sale. Hidden not far from the city and shopping vicinity,this property is located in a convenient location with many coffee shops and restaurants for local dining. The resort offers luxury Thai accommodation with all modern amenities with 2 swimming pools, set in secluded and peaceful tropical gardens. The compound comprises accommodation in two traditional wooden houses and eight bangalows, offering 12 rooms with ensuite bathrooms. The bathrooms have a choice of shower, large spa bath or whirlpool Jacuzzis. RS047- Resort for sale in Chiangmai Thailand. This is a beautiful resort on the river Ping. There are 6 beautiful and Private bungalow plus one main house for 3 beautiful bedroom. Total is 10 room. There is a beautiful swimming Pool which you can see the river view from the Pool. They also have a big Jacuzzi beside the pool. There is a nice restaurant with dinning chair beside the pool which you get the river view and pool. The beautiful thai lanna style house with the private swimming pool. There are 4 bedroom, 4 bathroom plus the maid room. The house is quite good quality on building and material furniture privete and good location. It is only 20 minutes driving from the city and shopping mall. RS038 - Resort Lanna style with private swimming pool in Sarapee Chiangmai Thailand. The Lanna style with private swimming pool. It takes 20-25 munites to the city . Aad buetifull garden along the Ping rever. branch. It has a Lot of trees around the house with fully furnished. 1st Big hose hos 3 bedrrom,3 barthroom wiht big livving room on both floor. 3 nd Lanna House has 2 bedroom, 2 barthroom. 3 Guest-House can apply to be fully funchion for your buesiness. has Maid and car driver house separate. Beautiful Resort for Sale in Hang Dong, Chiangmai 3 independent houses provide sumptuous living space for three families. In total there are six bedrooms, six bathrooms, two indoor kitchens, and three outdoor kitchens. Special features include a dedicated meditation/yoga room, media room, 15 meter saltwater pool, 10 meter dual level goldfish pond and waterfall, spa with outdoor oil massage table, enclosed waterfall, ofuro soaking tub, rain shower and herbal steam rooms. Two bedrooms include walk-in closets with ensuite bathrooms. The third and master bedroom in addition includes a private living room, gym and wet bar with an elevated view of the pool and 2 meter waterfall (4 waterfalls in total). The 3200 m property is meticulously landscaped with a view of a magnificent stupa directly opposite elevated to about 30 meters. All electrical and plumbing elements are concealed underground. Rainwater is cleverly collected via a series of French rain catchment floor drains instead of unsightly gutters. Fiber optic cable, recessed LED lighting and multipoint speakers are installed throughout. All built-in furniture is customized solid teakwood and Brazilian pergola hardwood. Flooring is teakwood, rectified and hand glazed ceramic tile, pillars and feature walls are clad in sandstone, marble and imported granite. Walls are double layered lightweight brick for maximum heat insulation. All doors are solid teakwood. Other architectural and engineering details are best appreciated through inspection. All built in furniture, fixtures and appliances are included in this price. Guest House and Storage - including bedroom, outdoor kitchen and bathroom. North Wing - 2 bedrooms, 3 bathrooms (including steam room), full European kitchen, Dining area, Home Theatre, Outdoor living room. Dining Pavillion - outdoor dining area with fish pond and double waterfall. General Features Lot Size: 800 Sq.wa. Using area: 500 Sq.m. Price for Sale: 29,500,000 Baht. Facilities: Private Swimming Pool, Gym, Sauna, Children s Play ground Accessible to public transportation and amenities. 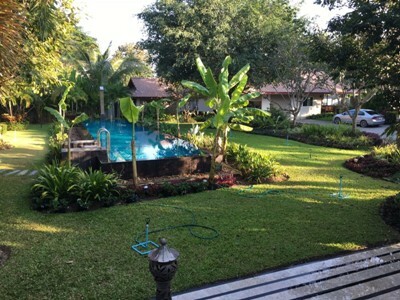 beautiful Resort for sale and quiet resort on 2 Rai area located in Sanpatong district, Chiang Mai. 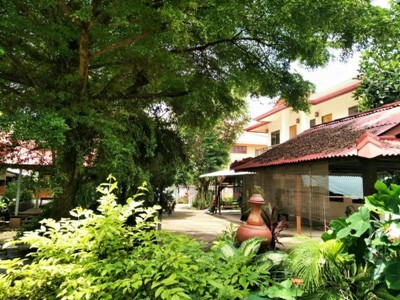 RS048- Risort for sale 25 rooms in Hod Chiangmai Thailand. Price for sale 29,000,000 bath. RS039- Resort for sale in Chiangmai ThaiLand. 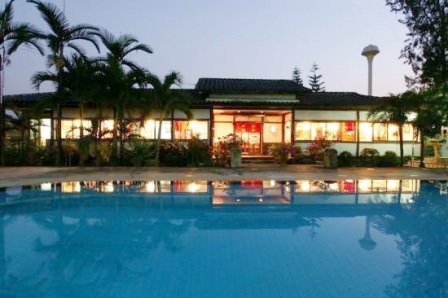 Resort for sale in Chiangmai, Thailand. Luxury resort with modern style for sale with nice mountain& lake view, lush tropical greenery and the Botanical Gardens. Located on the outskirts of Chiang Mai, this boutique property allows guests to enjoy both the city as well as the open space. 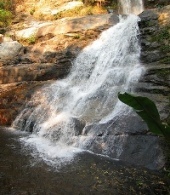 It is only a 10-15 minute drive to International Airport Chiangmai and just 5-10 minutes to Nimmanhemin, a famous road. A tour desk is available, to assist as well as to arrange transport to visit popular attractions in and around this Norther Thai city. The more active guests are sure to make use of the bicycle rental service available on site. Each of the spacious rooms at the resort come with complimentary internet access, LCD TV and a DVD player. 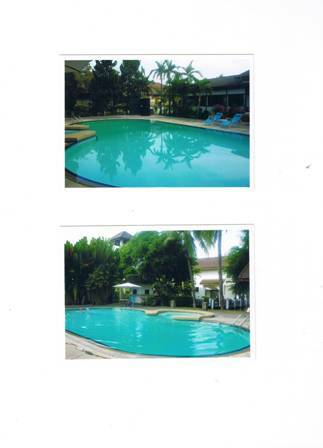 This Boutique Resort is an excellent choice if you are looking business for investment. Chiang Mai is a good travel destination for tourists looking for quiet primitive area where you can see encients architectures and ruins. Driving out to countryside to visit life styles hilltribe, nature landscape and many exciting activities awaiting for you. Chiang Mai is also a detination for writers and photographers looking for good sources for writing about or creating your new images to the world. 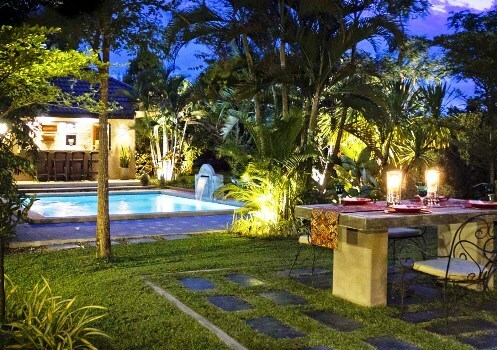 Dream Holiday Villa offers accommodation set among landscaped gardens in authentic style. Every room is spacious and luxuriously equipped with VIP facillities. As well as presenting cuisine in conventional surroundings we can provide open-air catering for special occasions in an attractive pool-side setting guaranteed to impress your guests. Although we have a karaoke lounge for live musical entertainment, we also have Thai, Chinese, Japanese and European music to suit all tastes. To help you relax, obliging, attractive hostesses cater to your every whim. 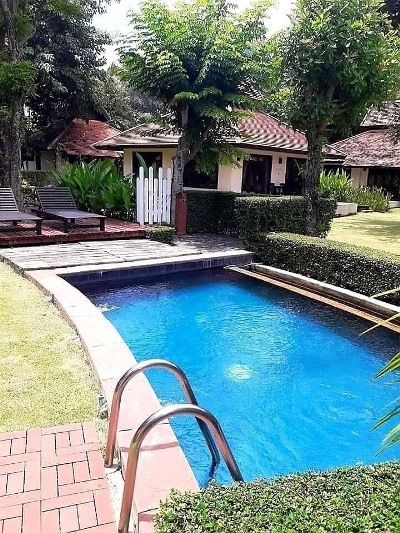 Situated on the outskirts of Chiang Mai, the peace and quiet of Dream Holidays Villa combined with high quality service at a reasonable price await to welcome you. 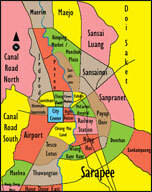 locates by Chiang Mai City at the beginning of Chiang Mai- Sankhumphaeng road. Just 10 minutes drive to and from the airport. 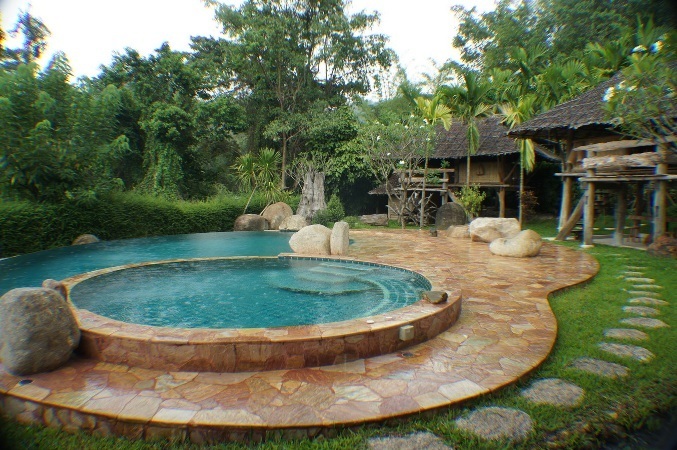 RS104- Resort style house for sale with private swinmingpool in Hangdong Chiangmai Thailand. 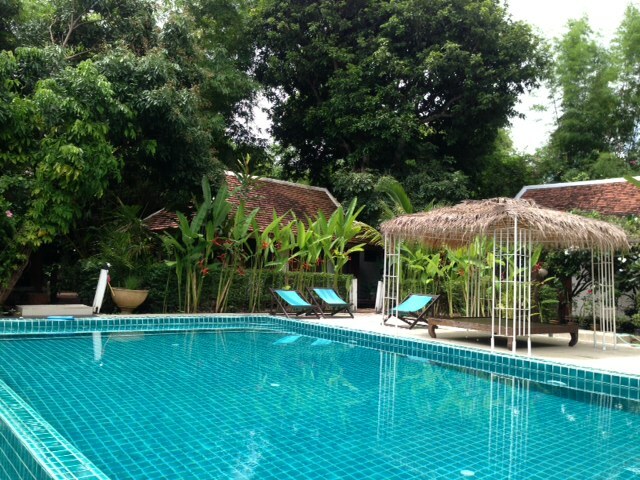 Resort style house with private swinmingpool in Hangdong Chiangmai Thailand. just fifteen minutes from downtown Chiang Mai in the serene foothills of Nam Phrae in Hang Dong, is move-in ready and offers a relaxing blend of Thai, Spanish, and unique architectural design touches. the distinctive 486 sq. meter floor plan features a large three-bedroom main home, separate two bedroom, two bath guest house with living area and kitchenette, plus an entertainer s full kitchen and bar off the sparkling salt-water pool, extensive open and covered patios, as well as ample storage rooms and large carport. The residence is set on 1,760 sq. meters (1 rai, 40 tahlong wah) of lush, beautifully landscaped grounds. Soaring ceilings, recessed energy-efficient lighting, exposed brick wall and archways, Saltillo-style tile floor accents, and classic ceiling fans. Custom-crafted teak cabinetry with soft-close hardware and polished concrete counter tops, appliances from gas cook-top and electric oven to vent hood and refrigerator and more. For year-round enjoyment, this tiled pool comes with a tranquil waterfall feature and is equipped with an easy-care salt-water system to keep your pool fresh and sparkling. Entertain indoors and out The home features tranquil patios and a covered outdoor dining area, and a vine-covered shade pergola off the main dining-entertainment patios. -Enjoy a fully-equipped cocina, perfect for a Thai kitchen. A quaint bar rounds out the pool area and makes entertaining easy. -Uncommonly beautiful interior design and western standards are incorporated into these new custom Thailand properties, truly setting your home apart. -This classic foyer features exposed brick archways, Saltillo-style tiles, classic Moroccan hand-crafted hanging lamp, and spacious French entry doors. 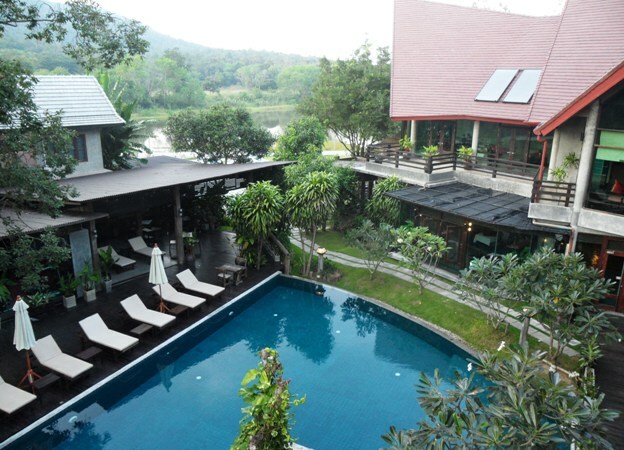 RS200- Resort style house with private swinmingpool in Hangdong Chiangmai Thailand. 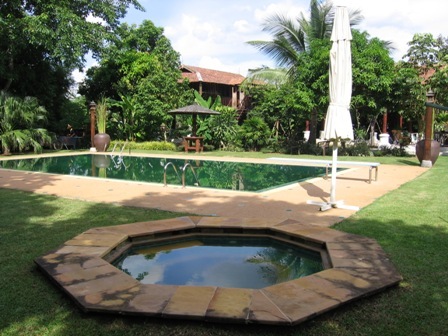 RS202- Resort for sale with private swinmingpool in Chiangmai Thailand. RS049- Resort for sale with Private Swimming Pool in Sankamphaeng chiangmai Thailand. RS067- Resort for sale in Cannal Road South Chiangmai, Thailand. 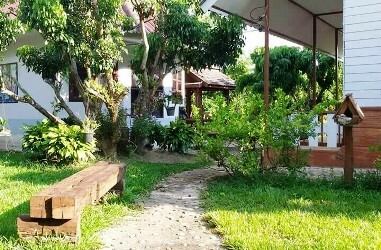 This peaceful resort is located on Chiangmai-Samoeng Rd., Nong Kwai sub-district, Hang Dong, Chiangmai. The resort area 363 Sq.wa., using area 600 Sq.m. There area 9 beds 12 baths,4 Living rooms, 1 Big Kitchen, 4 Small Kitchen, 1 Maid room, 1 Canteen, Air condition, Hot-Water, TV Refrigerator or fridge freezer., Secure Parking. with fully furnished. 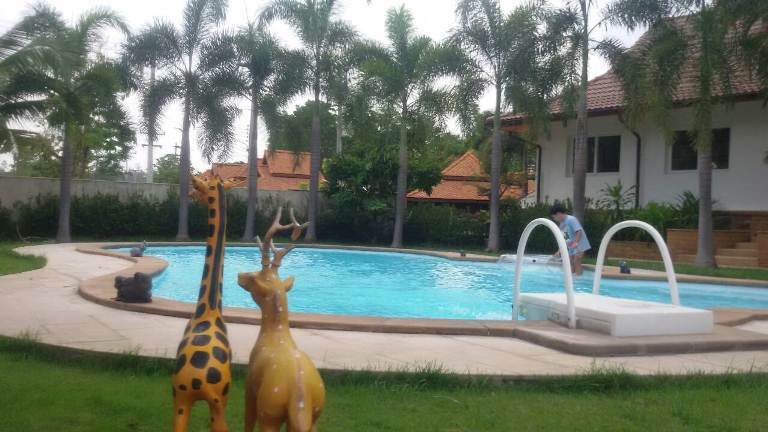 This resort is near by Royal Flora Ratchapruek Park, Chiangmai Night safari, Panyaden School and Hang Dong Golf Club. Resort for Sale in Sankampang-Doi Saket, Chiangmai. The Hot Springs Resort has a total of eight lovely rooms. Four are located in the main house and are all in the Thai- Lue style, built entirely from teak wood. Two more rooms are located in a remodeled ancient rice barn, and two private studios sit in a secluded garden amongst tall bamboos. Year round mild temperature, Wireless internet access throughout, TV and computer room, Swimming pool and Jacuzzi, 2 large indoor tiled baths with natural hot springs water, Outdoor wooden bathtub with natural hot springs water, Bicycles for cycling and exploring the village. Travelling from Chiang Mai, take the 118 Highway towards Chiang Rai, at the 27km signpost turn right, on the corner you will see a police box. Continue down the road for 2km, you will see another turn in the road towards the left behind the Doi Saket Hot Springs, take this turning and just shortly up the road you will see Hot Springs House.